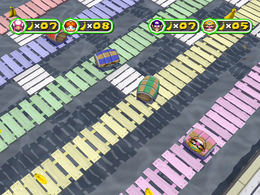 Pier Factor is a Donkey Kong minigame in Mario Party 6. Its name is a reference to the game show Fear Factor. The surroundings of the area suggest that the minigame takes place in the harbor of Delfino Plaza. Donkey Kong eats a banana at the end of the course, then leaps across the pier to the beginning, where the players are waiting. The whole point of the game is to get the most bananas, which in Party Mode are transferred into one, two, or three coins (depending on the roulette result). Each player starts by choosing one of the four barrels to jump into. The board, which is a crossway bridge, is covered with bananas. The barrels with the players in them roll down the bridge, turning at every possible chance. If two players bump into each other as they cross onto another path, they move backward and continue down their previous path. The four players do their victory poses, while Donkey Kong poses behind them. Rules – "Choose one of the five barrels. The barrels will collect bananas as they move down the pier." Advice – "If barrels hit each other, they will change direction." This page was last edited on September 29, 2018, at 21:36.